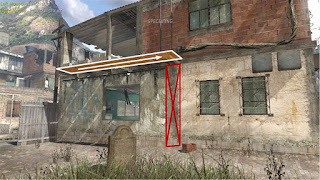 Sylvain "channie" Douce has done some excellent analysis of CoD:MW2's "Favela" -- read part 1 to understand the structure, then read part 2 for his excavation, where he wonders why certain rooms are there and even posits the former existence of a ladder based on how sloppy that part of the level feels. It functions in the same way that a ring road might denote the former existence of a city wall, building cities on top of cities on top of cities. Levels function the same way, existing as iterations layered over each other -- a virtual patina that exists only in context to the rest of the level. Western societies value this patina. We preserve buildings, we have a "National Register of Historic Places." Something old is something inherently valuable... Meanwhile, you get the Chinese government bulldozing hutongs and re-painting the Forbidden City. I'm a proponent of the former approach in real-life, so it's interesting that I don't nostalgize virtual environments in the same way at all. Why wouldn't you fix problems and smooth the cracks? That low-detail room and seam in Favela is a bug. And here, we squash bugs. No one lives in my levels, and there are no stakeholders or community councils to notify about the impending demolition. But consider this. Someday, you will have a 9 year old child. You will point out the neighborhood you grew up in, and the streets where you used to play. She'll laugh; CS 1.6 is a 32-bit cold program, it's barely compatible with today's average quantum biological wetware. And de_dust... why, she can see the pixels in the textures! It's all laughable, really. It's great though, that you took the time to show her how video games used to be so old and obsolete. You'll stay silent and mime a chuckle. That's when she'll realize she's hurt your feelings, and that's how she'll learn the weight of the dead is always shouldered by the living. Counter-Strike: Global Offensive is currently in private beta testing.